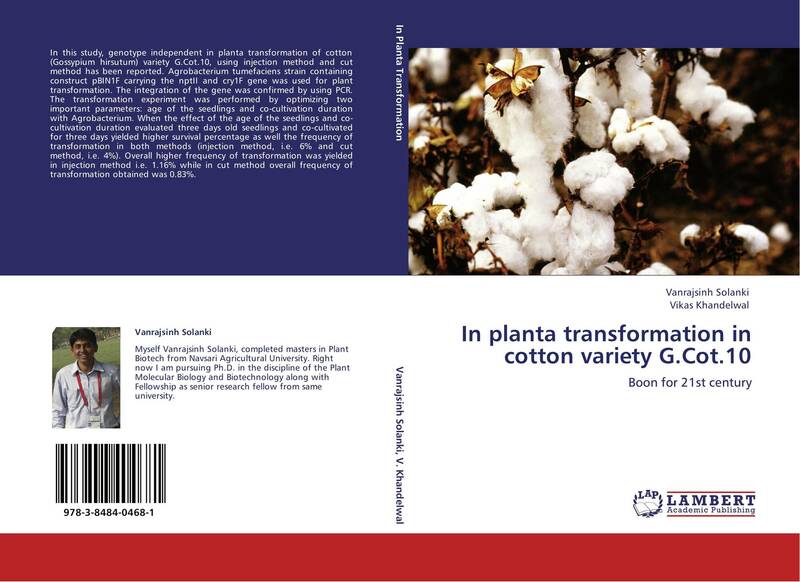 In this study, genotype independent in planta transformation of cotton (Gossypium hirsutum) variety G.Cot.10, using injection method and cut method has been reported. Agrobacterium tumefaciens strain containing construct pBIN1F carrying the nptII and cry1F gene was used for plant transformation. The integration of the gene was confirmed by using PCR. The transformation experiment was performed by optimizing two important parameters: age of the seedlings and co-cultivation duration with Agrobacterium. When the effect of the age of the seedlings and co-cultivation duration evaluated three days old seedlings and co-cultivated for three days yielded higher survival percentage as well the frequency of transformation in both methods (injection method, i.e. 6% and cut method, i.e. 4%). Overall higher frequency of transformation was yielded in injection method i.e. 1.16% while in cut method overall frequency of transformation obtained was 0.83%.